HOURS: 10am to 8pm (7 days a week) – Water is on and the jets are active during these hours except for when the air temperature falls below 65 degrees! For organized events, contact the City with the date, time and anticipated number of participants by calling 669-6619. Individual sections or features of the park cannot be reserved since this is a public park. small group and organizational meetings. may venture into the occupied area where the function is being held. Cordoning off or preventing the public use of any area of the park is not allowed. Knowlton Park is a child oriented park and events should be kept at a “PG” level rating. Organized group events should be “open to the public” and “admission fees” cannot be charged. arrangements must be made by calling the City at 669-6619. Events requiring electricity should be coordinated through the City. Any group desiring the use of the Amphitheatre and needing electricity must contact the City and fill out an event form. City’s insurance does not allow for the use of: bounce houses, petting zoos or dunk tanks on any City owned property. Solicitation is not allowed on park grounds. Please help keep our parks safe and beautiful for all users by leaving the park in as good as, or better condition than when you entered. Leave the park in as good as, or better condition than when you entered. Dogs and/or domestic animals must be kept on a continuously held leash no longer than 8 feet in length. Pet owners must remove and dispose of animal waste (from all areas in the park) in trash receptacles. turf or any other vegetation or moveable or immovable park property. Park parking lots are for park users, long term daytime use is prohibited and overnight parking is not allowed. No motorized vehicles (with exception of motorized wheelchairs/scooters for the handicapped). No skateboards, scooters, rollerblades, roller-skates, trikes or bicycles are allowed in the park. All city, state and federal laws must be followed. No Loitering, Solicitation or Peddling. No disturbances (vulgar language/lewd conduct/unusually loud noises). No person shall possess, use, or discharge any type of firework, explosive device, or incendiary device within the parks. Do not hit or kick; balls, baseballs, softballs, soccer balls or any other object in the direction of the fences. Climbing on fences is also prohibited. City parks and recreation areas are tobacco/smoke free zones (unless otherwise indicated by appropriate “designated smoking area” signage). Use of illegal substances prohibited. Reasonably sized groups are welcome to use the park on a first come basis; those involved should fully expect and anticipate that others enjoying the park may venture into the occupied area where the function is being held at any time. Reserving of any individual section or feature of the park cannot be allowed since this is a public park. (Call 669-6619 to let the City know of your intended use.) Amphitheatre use must be coordinated with the City, a use fee will apply and noise ordinance restrictions will be enforced.) 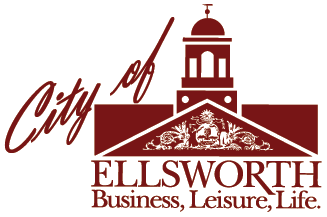 Contact the City of Ellsworth with inquiries regarding park availability for large groups/Special Events. Persons in violation of park rules shall be fully and financially responsible for any damages to park property and equipment and shall be prosecuted to the fullest extent of the law. The park is open from dawn to 11PM unless otherwise posted or and are patrolled, secured and under surveillance by the City of Ellsworth Police Department. Splash Pad will operate during the hours of 10AM and 8PM only. Water is deactivated from 8PM to 10AM. Splash Pad will not operate when the air temperature falls below 65°. Use “STEP HERE” button to activate the Splash Pad in 100 second intervals. SAFETY FIRST! Parents, guardians and care providers, are responsible for monitoring the behavior of the children under their care and are asked to keep the safety of all users an utmost priority. Enjoy the splash pad water feature. Play safe and respect other users. Be especially careful of small children. Splash Pad hours of operation will be from 10AM to 8PM and shall be open daily on a seasonal basis. Opening and Closing of the splash pad feature shall be at the City’s discretion. Help keep the water feature safe, useable and in working order by keeping glass, pets, soap, dirt, sand, breakable objects, landscaping materials, bicycles and skateboards out of the splash pad area. If the water jets do not appear to be operating at the splash pad, use the “Step Here” buttons in the concrete surround to awaken the splash pad from sleep mode. (The water supply is completely shut down from 8PM to 10AM, stepping on the buttons will NOT activate the water during those hours AND the Splash Pad will not operate if the air temperature is below 65 degrees.) Please conserve water and only step on the activation pads when using the splash pad and not just to watch the splash pad operate.) Be kind to the activation buttons, it is not necessary to jump up and down on them in order to activatethe flow of water! No skateboards, scooters, rollerblades, roller-skates, trikes or bicycles allowed in the splash pad area OR in the park in general. (With exception of motorized wheelchairs/scooters for the handicapped). times will change seasonally depending on usage.